Currently, the market is filled with a variety of gun holsters of different materials, sizes and design. Unfortunately, not all of them are perfect for concealed carry. No doubt they may help you to hide your gun, but can prove to be dangerous when it comes to a smooth draw. That's where my Top 10 Urban Carry Holster Review comes in to help make your buying decision a lot easier. Now, if you are a strong defender of the second amendment, good quality holsters would be something that you would always look for. And you would find yourself asking the experts and Googling about the Best Holsters that you can get for your money. In fact, this is the most important decision that you have to take immediately after purchasing a firearm. Why It Is Important To Have A Perfect Holster? On the basis of the above mentioned qualities, we have selected the Top 10 Urban Carry Holsters that have been tested by a panel of holsters experts. This would give you a clear idea as to what the holster is all about and the firearms for which the specific holster is apt for. So, let’s get started. 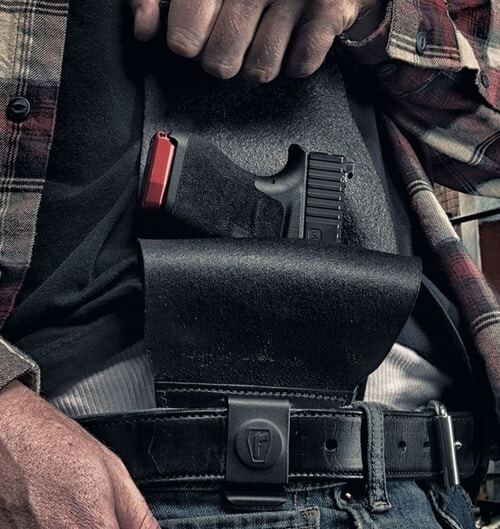 If you are looking for total concealment, then Urban Carry G2 Holster is what you need. It is a type of IWB and is ideal for handguns like Glock, Springfield, S&W, Ruger and several other brands of the similar frame. It features a customized steel clip that can easily withstand against any force and can easily secure the holster onto the waistband without any help. The leather is already pre-conditioned, so you don’t have to wait for break-in. For many, this may be the updated version of the G2 Urban Carry, but this isn’t so. It is the original, first Gen Urban Carry Holster that is manufactured from the premium quality saddle grade leather. It is a comfortable CCW IWB holster and can easily accommodate firearms such as Glock, Sig, Springfield, S&W and others as well. Available in various sizes such as Small, Medium, Large and X-Large, the perfect size depends on the firearm that you are carrying. But if you are looking for a quick draw or a seated draw, then you should check out the other designs. If you are the owner of Sig Sauer P320 Carry that has a barrel of 3.9”, then Sig Sauer P320 Carry IWb-PlusHolster is the perfect concealed carry holster. It is a right handed, IWB holster that easily responds to your needs. It can be worn easily with a business suit or casual attire without worrying about printing. The most amazing feature of this holster is its 360 rotation of the firearm shell for swift draw. It comes with adjustable J-clips that makes carrying this holster quite comfortable. Specifically designed for Glock 19 with the barrel size of 4.0”, Glock 19 OWB Holster, Modular REVO Right Handed is essentially a right handed, OWB gun holster. It offers you efficient and quick draw that permits a firm grip over the firearm. The unique and patented design features 360 degree rotation of the shell that offers you a customized draw according to your own requirements. It comes with riveted half-moon straps to lock the shell on the place. If you are looking for a customized gun holster for your Beretta M9 that allows you to have an individualized draw, then it is Beretta M9 Ankle Holster that you are looking for. Designed for Beretta M9 with the barrel size of 4.9, this is a right sided, drop leg leather holster with a unique and revolutionary design. The shell comes with an astonishing feature of rotating around 360 degrees for swift draw. This holster can beworn on either of the legs, inside or outside the ankle. In case your preferred style for the everyday carry is the shoulder holster than the Shoulder Holster Modular REVO Right Handed is something that is made just for you. This one is specifically made for the Sig Sauer P938 with a barrel size of 3.0”. You can also attach the REVO magazine holster or any other additional firearm holster that you want to carry with you. This one gives you a quick, right side access to your Sig Sauer as it can be easily rotated to 3600. If you own a Colt Defender with a barrel size of 3”, then the right handed Colt Defender 3in. Appendix Holster, Modular REVO is perfect for you. It is an IWB Gun Holster that provides you customized adjustments due to the 360 degrees rotation of the Defender shell. Moreover, you can always change the shades of the cant of the outer shield to match the body color. All thanks to the J-clip that are powder coated. Are you looking for a perfect gun holster for your Walther PPQ M2 with the barrel size of 4”? Then, we would suggest you to go for Walther PPQ M2-4in Drop Leg Thigh Holster, Modular REVO Left Handed. This one is comfortable to carry and sits lower on the body that gives easy access to the firearm whenever you need it, especially when you are dealing with a hand to hand combat. It is ahandcrafted leather gun holster that can be easily rotated for a customized and easy draw. If you are looking for a gun holster for Kimber Ultra Carry II that has a barrel size of 3”, then we would recommend Kimber Ultra Carry II 3 in. Waistband Hybrid Tuckable Holster. It has 5 levels of adjustment for ride height and forward cant to ensure the holster molds to your body with a comfortable fit. CZ 75 Appendix Holster, Modular REVO Right Handed is specifically designed for CZ 75 that comes with a barrel size of 4.7”. It is an appendix IWB leather gun holster that is recommended by the experts all over the world. Just like all other Modular REVO designs, this one also offers you 360 degrees rotation of the 75 shell. This ensures you can have a swift and unhindered draw at the time of combat. With this one, you get the indivisualized cant for both rig and shell. Well that wraps up our Urban Carry Holster Review article. These are a few of the many urban carry holsters that you can choose for your concealed carry needs. But always remember one thing while selecting a gun holster. One size doesn’t fit all and just like the firearms are unique, the gun holsters are unique as well.